To appreciate the benefits of cross-adsorbed secondary antibodies you need to understand the specificity of the polyclonal secondary antibody. 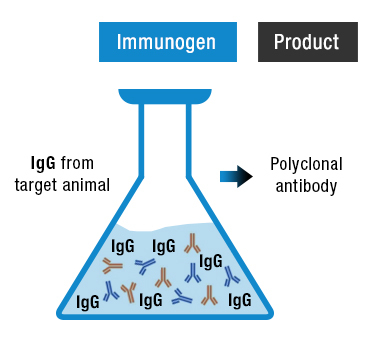 Polyclonal secondary antibodies are raised by immunizing the host animal with immunoglobulin from the target animal. 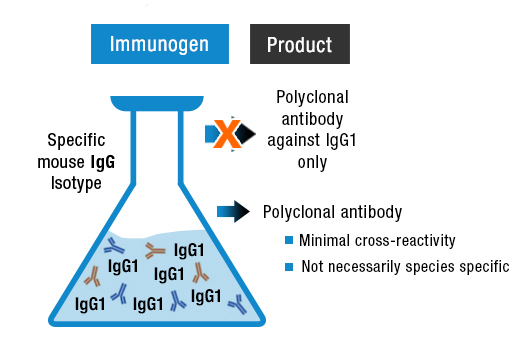 The resulting specificity of the polyclonal secondary will depend on the purity and composition of the immunoglobulin pool used for immunization. 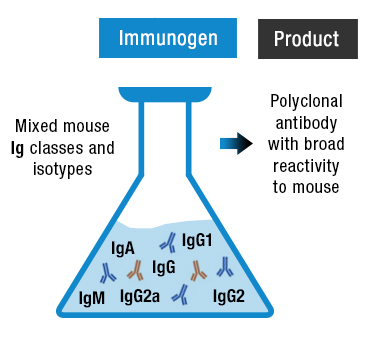 For example, immunising a goat with a pool of mixed mouse classes (for instance IgG, IgM, IgA) and isotypes (like IgG1, IgG2a, IgG2b) would be expected to give rise to a serum with a very broad reactivity towards mouse antibodies. Immunization with a purified mouse IgG1 preparation might be expected to generate a serum with a specific reactivity towards mouse IgG1 and no cross-reactivity with other antibody isotypes or species. Such sera are indeed generated, and after testing, can be described as having minimal cross-reactivity, however, due to the polyclonal nature of the serum combined with the conservation of some epitopes between species, classes and isotypes, this is often not the case. In this example, a component of the polyclonal serum may react with an epitope on mouse IgG1 that is also found on IgG2a, confounding the isotype specificity. Likewise, an epitope on mouse IgG1 may also be shared with rat IgG, meaning the antiserum is not species specific. In many cases the absence of specificity of the secondary antibody, with a very broad reactivity, will not cause problems due to the specific application used or the lack of other target antibodies. However, when absolute specificity is required, for instance during multiplexing or to prevent background staining, a polyclonal secondary is required where the undesired reactivity has been removed by a process known as cross-adsorption. How Are Cross-Adsorbed Polyclonal Secondary Antibodies Generated? To remove an undesired reactivity from a polyclonal pool, an affinity chromatography column is used to covalently immobilize undesired molecules. This may consist of antibodies from the offending cross-reactive species, or antibodies of a different class or isotype. By passing the polyclonal serum through the column, clonal antibodies that also recognize the immobilized antigen(s) are removed. The unbound pool of antibodies is now cross-adsorbed against the immobilized antigen and should show no reactivity towards it. Efficient cross-adsorption may require multiple passes through a column and cross-adsorption against multiple antigens will require passes through multiple columns. The most common type of cross-adsorbed secondary antibody is species specific, most useful for multiplexing. For example immunofluorescence might be performed using both a mouse and rabbit primary antibody. By using cross-adsorbed secondary antibodies, the user can be assured that the signal reported by each secondary is specific to each primary. Species specific polyclonal secondaries can also be used to generate a genuine signal in sandwich ELISAs where the capture antibody is from a different host to the detection antibody. Use of a cross-reactive antibody in this case would cause blanket detection of the capture antibody. For western blotting of IgG rich samples, the use of a cross-reactive secondary antibody can lead to unwanted detection of heavy and light immunoglobulin chains from the sample on the blot. An example of this can be seen in Figure 1. Here Mouse Anti-Human Factor P (MCA2617) was visualized using a noncross-adsorbed secondary antibody, Goat Anti-Mouse IgG (H/L): HRP (STAR207P) (image A) and the cross-adsorbed secondary antibody, Goat Anti-Mouse IgG (H/L) (multi species adsorbed) (STAR117P) (image B). 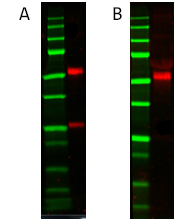 In image A you can clearly see that the antibody also detects the light chain, whereas on image B, only the target protein is detected. This can also be a problem when antibodies used for immunoprecipitation are detected on a blot. In both cases, switching to a cross-adsorbed secondary antibody can improve the situation. Fig. 1. Detection of Mouse Anti-Human Factor P (MCA2617) with A, Goat Anti-Mouse IgG (H/L):HRP (STAR207P) and B, Goat Anti-Mouse IgG (H/L) (multi species adsorbed) (STAR117P). Human serum was run on SDS PAGE using the primary antibody at a dilution of 1/1,000 and the secondary antibodies at a dilution of 1/10,000. In an analogous manner to species specific cross-adsorbed antibodies, secondary antibodies that have been cross-adsorbed against other classes (e.g. IgG, IgM, IgA) or isotypes (e.g. IgG1, IgG2a, IgG2b) can be used to prevent unwanted detection. Recombinant, isotype specific antibodies have been generated against the three main mouse isotypes: IgG1 (HCA309), IgG2a (HCA310), and IgG2b (HCA311). These antibodies detect individual isotypes without any species or isotype cross-reactivity, enabling more than one unlabeled mouse monoclonal antibody to be used at any one time, for multiplexing without species issues. Click here to learn more. Not all polyclonal secondaries are cross-adsorbed to the same standard or measured in the same way. Check the reactivity in the application you are using; for example an antibody cross-adsorbed against rat IgG may not detect native rat IgG in an ELISA, but may detect denatured rat IgG on a western blot. When choosing primary antibodies for use in an experiment that requires cross-adsorption, select primary species that are not closely related (for instance not mouse and rat, or goat and sheep) as secondary antibodies cross-adsorbed against similar species are likely to have a much-reduced clonality. Likewise, if a secondary antibody that has been cross-adsorbed against your primary species of choice is not available, cross-adsorption against a closely related species may suffice (such as goat instead of sheep, human instead of chimpanzee).